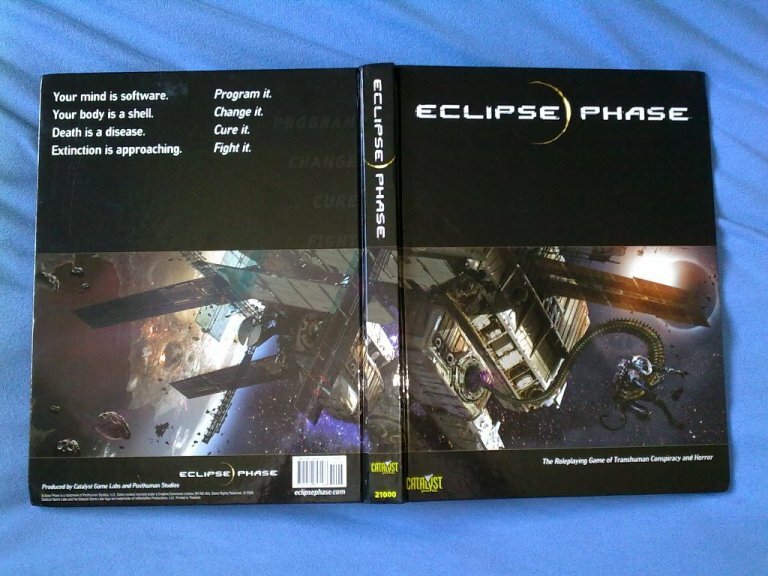 As one of the lucky people to have a copy of Eclipse Phase at this point, and settling down to read it, I figured that I'd share my thoughts here as I go along. I should state that I am a long-time sci-fi fan, but I am normally more of a shotguns-in-space Traveller gamer (Traveller the New Ear is my favourite sci-fi setting to date) and my sole exposure to anything transhuman is Richard Morgan's Altered Carbon novels; so I will be reading this from a non-transhuman savvy point of view. So, I am going to settle down and start reading the book and I'll post my thoughts here at the end of each chapter or section. I can't promise to read it all in the next few days as I am in the busy 30-something gamer parent category, but I'll get there. I hope you'll enjoy my ramblings, and find them useful. Also, I'm hoping other with the book will chime in to give their opinions, too. Once I get the the GM section I'll hide anything spoilerific behind hidden text, so this thread should be safe for players too. I too have turned my Eye towards this thread. 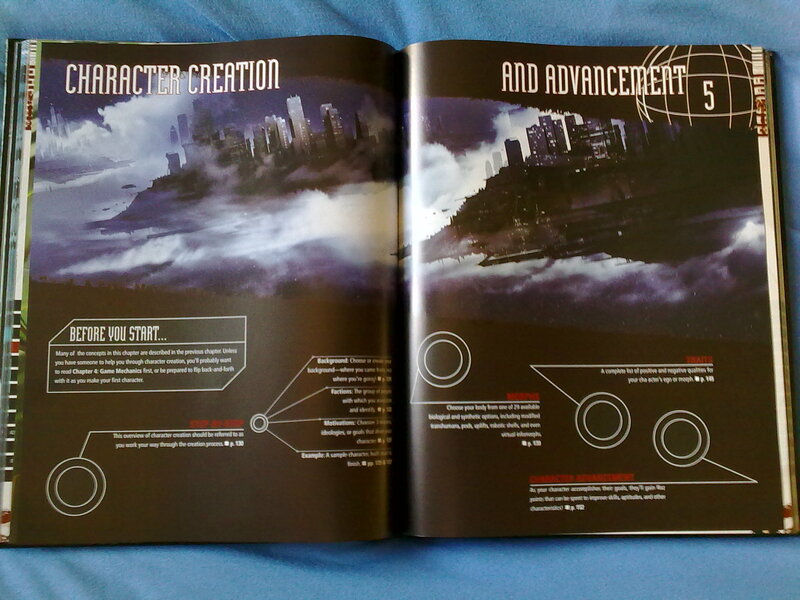 So, first up: initial impressions and a breakdown of the book contents. My first thought when I got it was that it is a striking black-covered book with a minimalist cover design that still reflects the typical black-bordered Catalyst game livery. As you can see, the image from the top of the EP site has been reproduced around the cover. The back cover text is very minimal and I suspect this is both an aesthetic choice and an acknowledgement that most gamers these days (in my opinion and reflecting most of my gamer friends) don't tend to buy new games based off the back cover text, but instead research it or are drawn to it by the overall look. YOMV, of course. My next thought was "wow, this book is heavy". It clocks in at 398 pages including the character sheet but is bound tightly. For example the excellent Earthdawn 3rd Edition Player's Guide is 304 pages and the same thickness. EP is noticeably heavier than the ED book. The book is full colour throughout except for the backs of the end papers (the cover image is reproduced inside the front and back covers as a double-page spread but the back of the first physical page of the book (and the last) is start white. it was noticeable and slightly jarring as every other page is full colour. There is a large three page table of contents that is nice and usable. Each chapter heading is in a different colour, as are the contents page entries for sidebars. At first look it seems usable but until I start playing it, or cross-referencing, I won't know. To answer a question I imagine some of you will have, yes there is an index. It is four pages long, and it is in a really small font size. Not too small to be usable in good light, but about the smallest limit of comfortable short use reading for me. That said, it's an index; I don't read them for fun. I have a high opinion of Catalyst's indices from recent products, so I am favourable about this one but it's utility will only be proven in use. My only complaint is that with the very small text the background for the pages (which has a pattern based on a stylised orbital map) seems a little obvious. So as you can see a step by step with page numbers, where to find morphs, traits, etc. Each chapter has this kind of thing. That's a nice idea and I'll see how useful it is as I go through. The book is a mostly two-column thing and aside from sidebars the actual text is on plain light-coloured column backgrounds that make it easy to read. 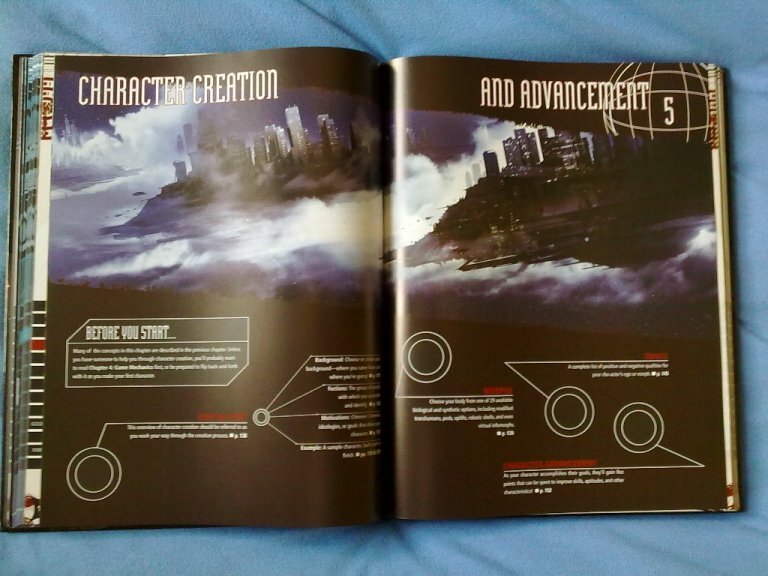 The graphic design of the fluff and crunch sections of the book have different colour schemes on the same layout style. It looks very nicely done indeed. The graphic design and layout is credited to Adam Jury and Mike Valliancourt (of Cthulhutech fame), so if you have seen recent SR books, or CTech, you know what to expect here. Enter the Singularity: 14 pages - this covers the basics of what is an RPG, what is transhumanism, and the basic concepts of the game sucvh as Ego, Morph and Terminology. A Time of Eclipse: 82 pages - this is the bulk of the fluff. It talks about transhumanity, culture, tech, politics, law, economy, habitats, factions, and has a meaty gazetteer of the solar system. Character Creation and Advancement: 26 pages - this does what it says on the tin; covers point spending, starting morphs, traits, skills, etc, and a short advancement section. Sample characters: 16 pages - this section does not have a double page start, so it has 16 example characters. I'll talk more about them when I get to that section but it looks like a good spread, with a high proportion of non-combat types. Skills: 16 pages - an overview of skills, how to learn them, aptitudes, and a breakdown by skill. Action and Combat: 30 pages - by what is in the contents list it seems to be a fairly standard combat chapter with turns, initiative, movement, etc, plus a healthy list of attack types and special effects and both physical and mental damage rules. Mind hacks: 18 pages - psi and psychosurgery. The Mesh: 32 pages - the mesh (the interwebz), interfacing, uses, abuses , AIs, reasearch, scanning and tracking, privacy, security, intrusion, counter-intrusion, subversion, brain hacking , infomorphs. big chapter indicating its important. Accelerated Future: 28 pages - this chapter appears to put the transhuman and future in, covering backups, resleeving, multiple copies and merging, egocasts, brokering morphs, identity, life in space, nanofabrication, reps and social networking. Gear: 56 pages - lots of stuff, acquiring gear, augmentation, drugs, everyday tech, nanotech, weapons, robots, vehicles. From my brief skim through there is a lot of implicit setting fluff mixed in to supplement the other fluff at the start. 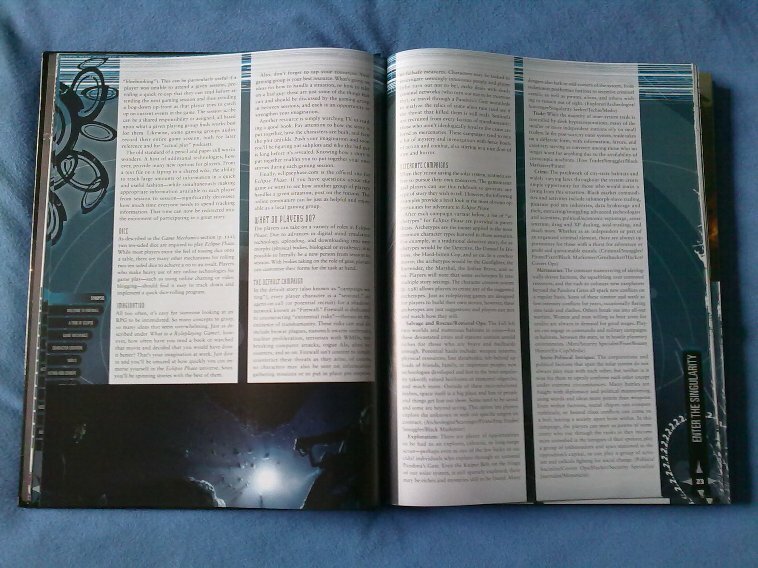 Game Information: 40 pages - the Gm section, covering the secrets that matter. I'll delve into this under spoiler protection later on. After this are four pages of tables, a two-page rules summary, a page of fiction and non-fiction references, the index and the character sheet. So, its a meaty tome. A lot of info and rules packed into it. Should be fun to push on through it. So, on to reading now. See you at the end of the intro. By the by, this is my first "let's read", so critique what I am doing please. Oh, and if the PHS or CGS folks object to my use of occasional photos please let me know. I'm going to skip the intro fiction. It's been discussed at length in another thread at length. I'll just say that it helped intro me to a number of the setting concepts, and gave me an idea for the feel of the setting. This 14-page chapter is the introduction to the game, the setting, and to gaming in general. It kicks off with a two-prong attack; both "what is roleplaying?" and "what is transhumanism?". The roleplaying intro approaches it from the angle of watching a movie and disagreeing with the protagonist going into the dark cellar where the serial killer is, and the "what would you do?" question. Its looks to be a nice, solid intro to what gaming is but without getting a non-gamer to read it I can't say if it does what it should. It does raise some good points about cooperative story-telling, not being a contest, and there being no right or wrong way to play. It also talks about what you need to play in terms of people and resources, what the gamesmaster does and how the book is designed to help you play. One nice thing here is that they speak about both playing face to face and online in various forms. The intro to transhumanism sidebar is a very light introduction to the concept, but works for a non-transhumanist like me. It talks about some of the major concepts of transhumanism such as singularities, and also the questions presented about the limits we should impose on ourselves as transhuman tech happens. A sidebar also talks about the three themes of EP. It is interesting that it describes itself as a post-apocalyptic RPG of transhuman conspiracy and horror. It doesn't mention sci-fi at all, thought hat is implicit in the term transhuman. They also define what they mean when they say post apocalyptic (focussing on the human condition questions), conspiracy (secrecy and focus on goals, lawful ro not), and horror (more psychological than gore). I like this as it helps eliminate disconnect between what I think of when those terms are presented and what the authors do; that way we can be on the same page when I read through. The next section is a description of different campaign types. The first is the default Firewall campaign. Other ideas presented, though not in much detail, are salvagers, explorers, traders, criminals, mercs, and intrigue. Each bit also talks about he kind of characters best suited to that type of play, though I would have liked to see this more tied into the example characters. Next up is a bit where play takes place in terms of habitats, the unknown and the mesh. This is a very short section, but does go towards stressing how important the mesh (teh interwebz) is in the setting. After a few paragraphs on the difference between ego and morph (the transferable mind and the disposable body), which stresses the importance to understanding the difference, it is on to a three page section on terminology. The terminology section has a lot of implicit setting material in it. Most of the terms make sense once you read the entry, but I can see myself flipping back to this bit a lot as I first read through. I chuckled when I got to "Redneck" - the slang term for rural Martians (a great double meaning). Also, the TITAN entry, with it meaning for "Total Information Tactical Awareness Network" did make me think "Skynet" immediately, especially as they all-but destroyed the Earth. The last two pages of this section are not mentioned in the index - the introduction to Firewall. I am not sure if it is an oversight, or deliberately as a nod tot he conspiracy. You get two views on Firewall; the party line and a bitter veteran agent's description. Sounds fun to be a Firewall agent, if you define fun as murder, secrecy, occasional genocide, and the chance of horrific death over and over again. Overall this was a functional and well-written introduction section. I have come to notice that the borders and gaps between columns are large, and there is a lot of non-text space on any given page. Granted the art that tends to fill this gap on some pages is great but it is a noticeably large amount of space compared to a number of other recent purchases. As to whether this is an issue or not depends upon personal preference, and on the fact that if the content is there I can handle the space given over to prettiness. Right now it isn't an issue, but I thought it deserved mention. Next it is on to the sizeable setting chapter "A Time of Eclipse". That will take me a chunk of time to read and digest, but I'll update once I have done it. With any luck I can read it this evening once the kids are in bed. Hope this is useful and informative so far. sold - when can I buy a copy ? Not a clue, though I imagine Catalyst will be yelling it from every virtual mountaintop when it is. Right now there isn't a specific street date for the physical books, we've been saying Fall but that depends on how long the boat takes, customs, and distribution chain issues. We're hearing that the pdf should be out this week hopefully though so you'll be able to get it that way soon. And thanks for the kind words Shane, glad you like it. No issue at all with the images, the game is Creative Commons licensed so feel free to share all the info you want.